The Georgia World Congress Center (GWCC) is a convention center in Atlanta, Georgia, USA. Enclosing some 3.9 million ft2 in exhibition space and hosting more than a million visitors each year, the GWCC is the third-largest convention center in the United States. Opened in 1976, the GWCC was the first state-owned convention center established in the United States. The center is operated on behalf of the state by the Georgia World Congress Center Authority, which was chartered in 1971 by Georgia General Assembly to develop an international trade and exhibition center in Atlanta. The authority later developed the Georgia Dome, Centennial Olympic Park, and Mercedes-Benz Stadium, which replaced the Georgia Dome. In 2017, the Georgia Dome was closed on March 5 and demolished by implosion on November 20 while Mercedes-Benz Stadium officially opened on August 26. While the GWCCA owns Mercedes-Benz Stadium, AMB Group, the parent organization for the National Football League's Atlanta Falcons and Major League Soccer's Atlanta United FC, is responsible for the stadium's operations. Arthur M. Blank is an American businessman and a co-founder of The Home Depot. He currently owns two professional sporting teams based in Atlanta, Georgia, the Atlanta Falcons of the National Football League and Atlanta United of Major League Soccer. Mohammed Kasim Reed is an American attorney and former politician who was the 59th mayor of Atlanta, Georgia's state capital and largest city, from 2010 to 2018. In April 2014, the Peach Bowl, one of the six rotating semifinal sites for the College Football Playoff, announced it would move to the new stadium from the Georgia Dome beginning with the 2017 season. In years when the Peach Bowl does not host a semi-final College Football Playoff Championship game, the Peach Bowl will host one of the College Football Playoff New Year's Six bowl games. On September 8, 2015, it was announced that the SEC Championship Game would be held at the stadium beginning in 2017 and remain there until 2027. The SEC Championship Game dates back to 1992 and is the oldest conference championship game in college football. In 2017, Georgia and Auburn would meet in Mercedes Benz Stadium, in what would be a rematch from early regular season meeting. Looking to avenge their loss from week 11, Georgia would go on to defeat Auburn 28–7 and claim the 2017 SEC Conference Championship. 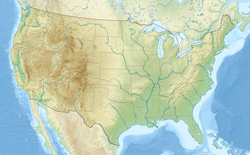 On November 4, 2015, it was announced that the 2018 College Football Playoff National Championship would be held at the stadium on January 8, 2018, beating out Houston, Miami Gardens, and Santa Clara. On Sunday December 3, 2017, four teams were selected by the College Football Playoff Committee to compete in the College Football Playoff Semifinals, with the winners of both semi-final games meeting in Atlanta on Monday January 8, 2018. In order of seeding the teams selected were: Clemson, Oklahoma, Georgia and Alabama. Both Georgia and Alabama would advance from the semi-final round and for the second time in the BCS/CFP era, two teams from the same conference (SEC) would play for the national championship. Alabama defeated Georgia 26–23 in overtime. On December 8, 2017, the stadium hosted the Georgia High School Association football championship games for Class 1A Private School and Class 3A. The remaining two championship games scheduled for that day, Class 5A and Class 6A, as well as the four games originally scheduled for the next day were postponed and relocated to campus sites due to a major snowstorm to hit Atlanta that weekend. The 2018 GHSA football championships were held on December 11 and 12, due to Atlanta United hosting MLS Cup 2018 on December 8  as well as the 2018 Celebration Bowl scheduled for December 15. State Farm Arena is a multi-purpose indoor arena located in Atlanta, Georgia. The arena serves as the home venue for the National Basketball Association (NBA)'s Atlanta Hawks and the Women's National Basketball Association (WNBA)'s Atlanta Dream. It also served as home to the National Hockey League's Atlanta Thrashers from 1999 to 2011, before the team moved to Winnipeg. It opened in 1999 at a cost of $213.5 million, replacing the Omni Coliseum. It is owned by the Atlanta Fulton County Recreation Authority and operated by the Hawks, owned by Tony Ressler along with a group of investors including Grant Hill. For the 1996 Summer Olympics, a total of twenty-nine sports venues were used. Sports in Atlanta has a rich history, including the oldest on-campus NCAA Division I football stadium, Bobby Dodd Stadium, built in 1913 by the students of Georgia Tech. 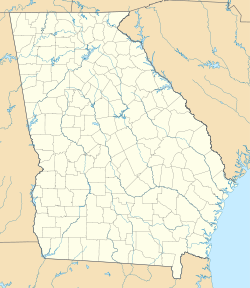 Atlanta also played host to the second intercollegiate football game in the South, played between the A&M College of Alabama and the University of Georgia in Piedmont Park in 1892; this game is now called the Deep South's Oldest Rivalry. The city hosts college football's annual Chick-fil-A Peach Bowl and the Peachtree Road Race, the world’s largest 10 km race. Atlanta was the host city for the Centennial 1996 Summer Olympics, and Downtown Atlanta's Centennial Olympic Park was built for and commemorates the games. The 2013 Atlanta Falcons season was the franchise's 48th season in the National Football League and the sixth under head coach Mike Smith. An expected Super Bowl contender riddled with injuries, the Falcons had a tough start to the season, finishing with a 4–12 record and failing to improve their 13–3 record from 2012. Thus missing the playoffs for the first time since 2009. The Celebration Bowl is a postseason college football bowl game. Sponsored by the Air Force Reserve, it was first played in the 2015 season. The game, organized by ESPN Events, is contested between the champions of the Mid-Eastern Athletic Conference (MEAC) and the Southwestern Athletic Conference (SWAC) — the two prominent conferences of historically black colleges and universities (HBCUs) in NCAA Division I. It serves as the de facto national championship of black college football and is the only active bowl game to feature teams from the Football Championship Subdivision (FCS). Starting with the December 2017 game, it is played at Atlanta's Mercedes-Benz Stadium; the first two games were played at the Georgia Dome. The 2017 season was the Atlanta Falcons' 52nd season in the National Football League and their third under head coach Dan Quinn. They entered the season as the defending NFC champions and tried to defend their NFC title for a second consecutive trip to the Super Bowl after losing the previous year against the Patriots in Super Bowl LI after blowing a 28-3 lead. This was the Falcons' first year in Mercedes-Benz Stadium after spending the previous 25 seasons in the Georgia Dome, which was demolished on November 20, 2017. Mercedes-Benz Stadium opened as scheduled on August 26, 2017; however, its retractable roof system was incomplete. 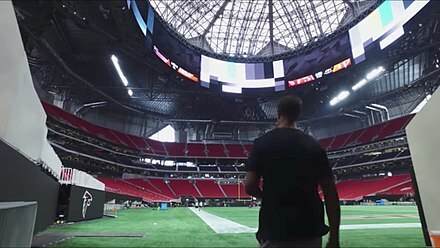 The roof of Mercedes-Benz Stadium remained in the closed position for most of the 2017 season, with the roof opened only during the September 17 game against the Green Bay Packers, as contractors continue to fully mechanize the roof. The 2017 New Orleans Saints season was the franchise's 51st season in the National Football League, the 42nd to host games at the Mercedes-Benz Superdome and the eleventh under head coach Sean Payton. The team improved on their 7–9 output from last season, while achieving an 8-game winning streak after losing their first two contests, their longest streak since 2009, when they won Super Bowl XLIV. In Week 13 the Saints clinched their first winning season since 2013 and swept the Carolina Panthers for the first time since 2011. In Week 16, the Saints clinched a playoff spot for the first time since 2013 by defeating the Atlanta Falcons. In Week 17, the Saints clinched the NFC South for the first time since 2011 with the Panthers loss to the Falcons. On January 7, 2018 the Saints played their divisional rivals the Carolina Panthers in the playoffs for the first time in franchise history. They beat Carolina for the third time, 31–26 in the Wild Card, but fell to the Minnesota Vikings 24–29 in the Divisional Round in a dramatic ending. The 2018 Major League Soccer All-Star Game was the 23rd edition of the annual Major League Soccer All-Star Game. It was held on August 1 at the Mercedes-Benz Stadium in Atlanta, Georgia and played against Italian club Juventus. The match was tied 1–1 after 90 minutes and was settled in a penalty shoot-out that Juventus won 5–3. The 2018 season was the Atlanta Falcons' 53rd in the National Football League, their second playing their home games at Mercedes-Benz Stadium and their fourth under head coach Dan Quinn. The Falcons attempted to be the first team to play the Super Bowl in their home stadium as an expected Super Bowl contender. However the Falcons were riddled with injuries, losing 7 starters to IR with the Falcons stumbling to a 1–4 start. The 2018 SEC Championship Game was played on Saturday, December 1, 2018, in the Mercedes-Benz Stadium in Atlanta, Georgia, to determine the 2018 football champion of the Southeastern Conference (SEC). The game featured the East Division champion Georgia against the West Division champion Alabama. Georgia, the East Division Champion, was the designated home team. The game was televised by CBS for the eighteenth straight year. Alabama came back from a 21–7 halftime deficit to defeat Georgia, 35–28. The 2018 Peach Bowl was a college football bowl game played on December 29, 2018. It was the 51st edition of the Peach Bowl, and the second Peach Bowl to be played in Mercedes-Benz Stadium. The game was one of the College Football Playoff New Year's Six bowl games, and one of the 2018–19 bowl games concluding the 2018 FBS football season. Sponsored by the Chick-fil-A restaurant franchise, the game was officially known as the Chick-fil-A Peach Bowl. ↑ Tucker, Tim (November 14, 2013). "Comparing Braves, Falcons Stadium Deals". The Atlanta Journal-Constitution . Retrieved February 21, 2014. ↑ "Atlanta United Single-Match Tickets to Go On-Sale for Mercedes-Benz Stadium". July 14, 2017. ↑ Roberson, Doug (September 7, 2017). "Atlanta United hopes fan bring the noise to Mercedes-Benz Stadium". The Atlanta Journal-Constitution. ↑ "Atlanta United sets MLS attendance records for single season and game". ESPN FC. October 22, 2017. Retrieved October 23, 2017. ↑ Roberson, Doug (December 9, 2018). "Atlanta United sets MLS Cup attendance record". The Atlanta Journal-Constitution . Retrieved December 9, 2018. ↑ Haley, Andy. "Football Field Dimensions and Goal Post Sizes: A Quick Guide". Stack.com. Retrieved June 7, 2017. ↑ de los Rios, Gabriel; Calderon, Rudy. "All 22 MLS stadiums for the 2017 season". Major League Soccer. Retrieved March 4, 2017. ↑ "Mercedes-Benz Stadium Will Have FieldTurf". Atlanta Falcons. Archived from the original on April 6, 2017. Retrieved April 4, 2017. ↑ Tucker, Tim (May 15, 2014). "Falcons Set Ground-Breaking Ceremony for Monday". The Atlanta Journal-Constitution . Retrieved May 28, 2014. ↑ Tucker, Tim (May 19, 2014). "At Stadium Groundbreaking, Blank Lobbies for a Super Bowl". The Atlanta Journal-Constitution . Retrieved June 3, 2014. ↑ Hanzus, Dan (April 30, 2013). "Atlanta Falcons' Stadium Concepts a Peek Into Future". National Football League . Retrieved April 30, 2013. 1 2 3 4 "Atlanta Falcons Move to Next Stages of Stadium Design Project" (Press release). Atlanta Falcons. June 18, 2013. Archived from the original on October 17, 2014. Retrieved February 21, 2014. 1 2 Saporta, Maria (April 29, 2013). "GWCCA Committee Approves 360 Architecture for Stadium Design". Atlanta Business Chronicle . Retrieved February 21, 2014. ↑ Tucker, Tim (August 24, 2015). "Falcons officially announce Mercedes-Benz as naming rights partner". The Atlanta Journal-Constitution . ↑ "Mercedes-Benz Stadium's video board could be a game changer". myAJC . Retrieved February 3, 2019. Called the “halo board” by everyone involved in the project, the 360-degree screen is 58 feet tall and 1,075 feet in circumference, totaling 62,350 square feet of light-emitting diodes. ↑ "Officials: Mercedes-Benz Stadium cost rises to $1.6 billion". bizjournals.com. June 17, 2016. Retrieved April 16, 2018. 1 2 Tucker, Tim. "Mercedes-Benz Stadium opening is pushed back again". The Atlanta Journal-Constitution. Retrieved April 18, 2017. 1 2 McQuade, Alec. "With roof incomplete, is Mercedes-Benz Stadium safe?". WXIA-TV. Retrieved August 28, 2017. 1 2 3 Tucker, Tim (July 27, 2018). "A guide to when Mercedes-Benz Stadium roof could be open". The Atlanta Journal-Constitution. Retrieved August 4, 2018. ↑ "McKay: Hope New Stadium by 2015". ESPN . May 21, 2010. Retrieved September 9, 2012. 1 2 Ledbetter, D. Orlando; Stafford, Leon (May 19, 2010). "Falcons Prefer New Open-Air Stadium, Downtown". The Atlanta Journal-Constitution . Retrieved September 9, 2012. ↑ Trubey, J. Scott; Saporta, Maria, Maria (May 19, 2010). "Falcons Want Open Air Stadium North of GWCC". Atlanta Business Chronicle . Retrieved September 9, 2012. ↑ "Roger Goodell: Atlanta Needs New Stadium to Host Super Bowl Again". USA Today . Associated Press. November 11, 2010. Retrieved September 9, 2012. ↑ Stafford, Leon; Ledbetter, D. Orlando; McWilliams, Jeremiah (February 22, 2011). "Falcons' Push for Open-Air Stadium Gets Lift". The Atlanta Journal-Constitution . Retrieved September 9, 2012. ↑ Stafford, Leon; Tucker, Tim (April 27, 2012). "New Falcons Stadium Cost Could Exceed $1 billion". The Atlanta Journal-Constitution . Retrieved September 9, 2012. ↑ Stafford, Leon; Tucker, Tim (April 25, 2012). "New Stadium Plan: Retractable Roof, Demolish Dome". The Atlanta Journal-Constitution . Retrieved March 19, 2013. 1 2 "Atlanta Falcons seeking $1 billion retractable-roof stadium". Fox News. April 26, 2012. Retrieved September 9, 2012. ↑ Stafford, Leon (May 26, 2012). "Neighbors of Potential New Stadium Seek Voice". The Atlanta Journal-Constitution . Retrieved August 8, 2012. ↑ Stafford, Leon; Tucker, Tim (August 24, 2012). "Stadium Deal Could Be Done by End of Year". The Atlanta Journal-Constitution . Retrieved September 9, 2012. ↑ McWilliams, Jeremiah; Tucker, Tim (September 10, 2012). "Reed: Work Around New Falcons Stadium Could Boost Cost to $1.2 Billion". The Atlanta Journal-Constitution . Retrieved September 12, 2012. ↑ Stafford, Leon (December 10, 2012). "GWCCA Approves Falcons Stadium Blueprint". The Atlanta Journal-Constitution . Retrieved January 10, 2013. ↑ Tierney, Mike (December 15, 2012). "Falcons Seek New Dome, Not Atlanta Fixer-Upper". The New York Times . Retrieved January 10, 2013. ↑ McWilliams, Jeremiah (January 10, 2013). "Mayor Reed confident Atlanta will get new stadium". The Atlanta Journal-Constitution . Retrieved January 10, 2013. ↑ Suggs, Ernie; Tucker, Tim (March 19, 2013). "Atlanta council clears stadium plan". The Atlanta Journal-Constitution . Retrieved March 19, 2013. ↑ Farrar, Doug (June 18, 2013). "Falcons have initial approval to go forward with futuristic stadium design". Shutdown Corner. Yahoo! Sports . Retrieved November 23, 2013. ↑ Caldwell, Carla (October 14, 2013). "Blank: Falcons Stadium Groundbreaking Week of March 31". Atlanta Business Chronicle . Retrieved February 21, 2014. ↑ Shapiro, Jonathan (April 10, 2014). "Judge Hears Arguments In Legal Challenge Of Falcons Stadium Financing". WABE . Atlanta. Retrieved May 14, 2014. ↑ Tucker, Tim (May 19, 2014). "At stadium groundbreaking, Blank lobbies for a Super Bowl". The Atlanta Journal-Constitution . Retrieved May 19, 2014. ↑ Stafford, Diane (August 19, 2014). "HOK Will Acquire Kansas City-Based 360 Architecture". The Kansas City Star . Retrieved February 13, 2015. 1 2 Newcomb, Tim (April 16, 2014). "MLS in Atlanta: The $1.2 Billion Stadium Blank's New Team Will Share with the Falcons". Sports Illustrated . Archived from the original on April 22, 2014. Retrieved May 14, 2014. ↑ Tucker, Tim (June 21, 2014). "Falcons, Braves Stadium Designs Advance". The Atlanta Journal-Constitution . Retrieved February 13, 2015. ↑ Tucker, Tim (January 30, 2015). "Falcons Hire Firm to Build NFL's Largest Video Board". The Atlanta Journal-Constitution . Retrieved February 5, 2015. ↑ Tim Tucker (June 21, 2014). "Falcons, Braves stadium designs advance". MyAJC . Retrieved April 11, 2017. ↑ "In Atlanta's New $1.5 Billion Football Stadium, the High-Priced Artworks Will Outnumber the Players – artnet News". August 7, 2017. ↑ Straus, Brian (April 18, 2014). "Former Crew GM, Current Falcons VP Confident Blank, MLS Will Be Fruitful Combo". Sports Illustrated . Archived from the original on April 23, 2014. Retrieved May 14, 2014. ↑ Maisel, Ivan (January 3, 2018). "How Atlanta became the capital of college football". ESPN.com. Retrieved January 6, 2018. ↑ "Chick-fil-A at Atlanta Falcons' new stadium will be closed Sundays". Fox News. August 17, 2017. Retrieved April 6, 2018. ↑ Wagner-McGough, Sean (August 16, 2017). "The Falcons' billion-dollar stadium will have a Chick-fil-A that's almost never open". CBS Sports. Retrieved August 30, 2017. ↑ Tucker, Tim. "Georgia Dome implosion date set". The Atlanta Journal-Constitution. Retrieved July 5, 2017. ↑ McClure, Vaughn. "Falcons' stadium roof will be closed for home opener vs. Packers". ESPN. Retrieved July 26, 2017. ↑ McQuade, Alec. "Exclusive: Mercedes-Benz Stadium officials reveal why retractable roof is delayed". WXIA-TV. Retrieved August 16, 2017. ↑ Tucker, Tim. "Falcons plan to open roof for home opener if weather cooperates". AJC. Retrieved September 10, 2017. ↑ Tucker, Tim (October 6, 2017). 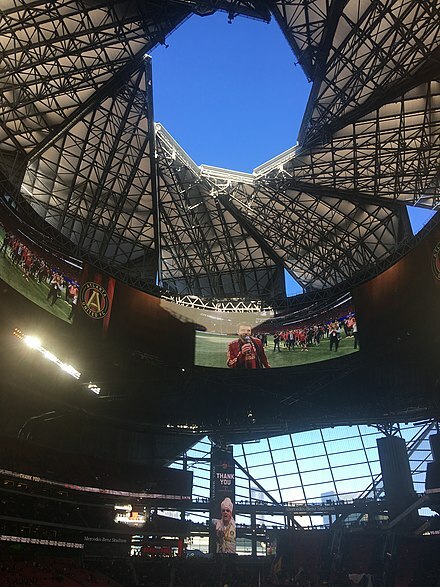 "Plan: Stadium roof will be closed for rest of Falcons season, open for one soccer game". The Atlanta Journal-Constitution. Retrieved October 10, 2017. ↑ EndPlay (January 30, 2018). "Mercedes-Benz Stadium will add more exit doors". WSBTV. Retrieved January 30, 2018. ↑ Tucker, Tim (February 7, 2019). "Mercedes-Benz Stadium turf will be replaced". The Atlanta Journal-Constitution. Retrieved February 9, 2019. 1 2 FOX. "When will Mercedes-Benz Stadium's roof fully work?". WAGA. Retrieved January 31, 2018. ↑ "Mercedes-Benz Stadium Roof To Open For Only 1 More 2017 Event | 90.1 FM WABE". 90.1 FM WABE. October 9, 2017. Retrieved January 31, 2018. ↑ Makrides, Alex. "Falcons expect Mercedes-Benz Stadium roof to open in 2018". ajc. Retrieved January 31, 2018. ↑ Tucker, Tim. "Mercedes-Benz Stadium roof is open". The Atlanta Journal-Constitution. Retrieved June 3, 2018. ↑ Tucker, Tim (July 25, 2018). "Mercedes-Benz Stadium roof opened in about eight minutes". The Atlanta Journal-Constitution. Retrieved July 26, 2018. ↑ Saporta, Maria; Wenk, Amy (December 2, 2014). "Atlanta Falcons stadium's Cost Will 'rise up' to $1.4 Billion". Atlanta Business Chronicle . Retrieved February 5, 2015. ↑ "Falcons Announce Controversial Ticket Pricing for New Stadium". WSB . Atlanta. January 8, 2015. Retrieved February 5, 2015. ↑ "Cannon Named CEO of AMB Group". Atlanta Falcons. Retrieved April 24, 2017. ↑ Tucker, Tim. "Falcons officially announce Mercedes-Benz as naming rights partner". Atlanta Journal-Constitution. Retrieved August 24, 2015. ↑ Lefton, Terry (February 22, 2016). "Naming-rights market finds more takers". Sports Business Daily. Retrieved January 6, 2019. ↑ Cooper, Sam (April 21, 2014). "Chick-fil-A Bowl Adds Peach Back to Its Name, Will Be One of Six Semifinal Sites for College Football Playoff". Yahoo! Sports . Retrieved February 5, 2015. ↑ "SEC Championship Game to remain in Atlanta until 2027". ESPN. Retrieved September 8, 2015. ↑ Taylor, John. "Atlanta (2018), Santa Clara (2019), New Orleans (2020) selected as future title game sites". CollegeFootballTalk. Retrieved November 4, 2015. ↑ "GT To Play Annual Game At Mercedes-Benz Stadium". Georgia Tech Athletics. Retrieved March 1, 2019. ↑ "Super Bowl LIII - Los Angeles Rams vs. New England Patriots - February 3rd, 2019". Pro-Football-Reference.com. Retrieved 2019-02-08. ↑ Roberson, Doug. "Atlanta will host 2018 MLS All-Star game". Ajc.com. ↑ Roberson, Doug (August 1, 2018). "Martinez scores but MLS All-Stars fall to Juventus in front of record crowd". Atlanta Journal-Constitution . Retrieved August 1, 2018. ↑ Doug, Roberson. "Atlanta United sets MLS Cup attendance record". The Atlanta Journal-Constitution. Retrieved December 22, 2018. ↑ "Garth Brooks fans complained of audio issue during first concert at Mercedes-Benz Stadium". Ajc.com. Retrieved April 16, 2018. ↑ "Mercedes-Benz Stadium officials confident of sound fixes for Kenny Chesney concert". Ajc.com. Retrieved November 23, 2018. ↑ "Concert review: Kenny Chesney, Thomas Rhett performed with (mostly) improved sound at Mercedes-Benz Stadium". Ajc.com. Retrieved November 23, 2018. ↑ "Current Boxscore". web.archive.org. Retrieved February 5, 2019. ↑ "Taylor Swift reputation Stadium Tour". mercedesbenzstadium.com. Retrieved February 4, 2019. ↑ "Current Boxscore". web.archive.org. Retrieved February 4, 2019. ↑ "Taylor Swift plays for more that 115,000 in Atlanta". Ajc.com. Retrieved February 4, 2019. ↑ "Jay-Z and Beyoncé Announce Additional OTR II Tour Dates Due to Overwhelming Demand". mercedesbenzstadium.com. Retrieved February 5, 2019. ↑ "Ed Sheeran". mercedesbenzstadium.com. Retrieved February 5, 2019. ↑ "George Strait". mercedesbenzstadium.com. Retrieved February 5, 2019. ↑ "Weather Forces Postponement of Saturday Football Finals - GHSA.net". www.ghsa.net. ↑ "Football Championships by Georgia Farm Bureau on Dec. 11–12". Georgia High School Association. Retrieved December 8, 2018. ↑ "Spoilers: Atlanta Supercross Results and Coverage". Ultimate Motorcycling. March 4, 2018. Retrieved April 6, 2018. ↑ Tucker, Tim (November 14, 2014). "Atlanta Lands Final Four in 2020". The Atlanta Journal-Constitution . Retrieved February 5, 2015. ↑ "Mercedes-Benz Stadium expected to host '18 DCI Southeastern Championship". DCI.org. Retrieved July 30, 2018. ↑ Parke, Caleb (January 4, 2019). "At Passion 2019, students raise $400G to translate Bible for deaf people across world". Fox News. Retrieved February 7, 2019. ↑ Nordyke, Kimberly (December 11, 2017). "Science Channel Adds Two Series on Superstructures and Extreme Machines (Exclusive)". The Hollywood Reporter. Retrieved January 5, 2018. ↑ Scott Carasik (September 19, 2017). "Why the Falcons play a train horn at Mercedes-Benz Stadium". USA Today. ↑ Adnan Ikic (September 22, 2017). "Mercedes-Benz Stadium's Train Horn is Awesome". Fansided. 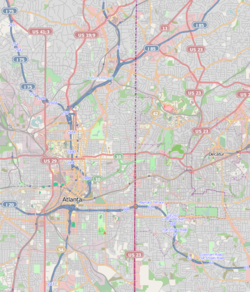 Wikimedia Commons has media related to Mercedes-Benz Stadium .